Ben Simmons had a career-high 24 points and added nine assists and seven rebounds to lead the Philadelphia 76ers to a 115-107 NBA win over the Houston Rockets. 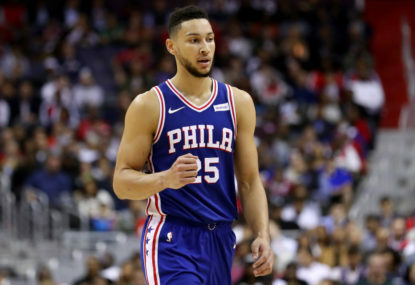 Rookie Simmons, who scored 23 points in Saturday’s win over Dallas, continued his superb early season form to lift the 76ers to their third win in their past four games after starting 0-3. Continuing to play point guard, the 208cm Australian’s partnership with big man Joel Embiid, 22 points and nine points, is gathering momentum. In his seven NBA starts, Simmons is averaging 17.5 points, 9.5 rebounds and 7.5 assists. After losing by a point on a buzzer-beating three-pointer from Eric Gordon at home a fortnight ago, the 76ers snapped an eight-game losing streak against the Rockets to win in Houston for the first time since February 2011. Houston’s All-Star James Harden scored 29 points and Gordon had 25. The 76ers led 58-56 at halftime and by as many as 14 points. They entered the fourth quarter up 92-80 and held on for an impressive road win against the 5-3 Rockets. In Boston, the Celtics beat the San Antonio Spurs 108-94 to improve their record to 5-2 after their fifth win on the trot. The Spurs have dropped their past three after they started the season 4-0. Kyrie Irving led all scorers with 24 points while the Celtics’ Aron Baynes (six points and five rebound) won the bragging rights better over his Australian countryman Patty Mills (senen points and four assists). Elsewhere, Utah’s Boomers swingman Joe Ingles had a poor shooting night but contributed on the boards and dished out six assists as the Jazz beat the Dallas Mavericks 104-89. Monday’s other winners were the New York Knicks, Charlotte Hornets, Orlando Magic and Minnesota Timberwolves.